Alexandria Domino's wins big. Again. And the winner of the 2009 Domino's Pizza Order Up! contest ... Oh come on, we already told you it was Alexandria! 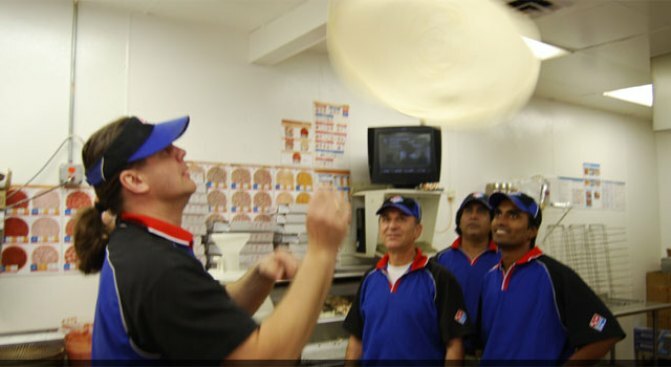 Domino's Pizza has again crowned three Alexandria, Va. residents its world's fastest pizza makers. 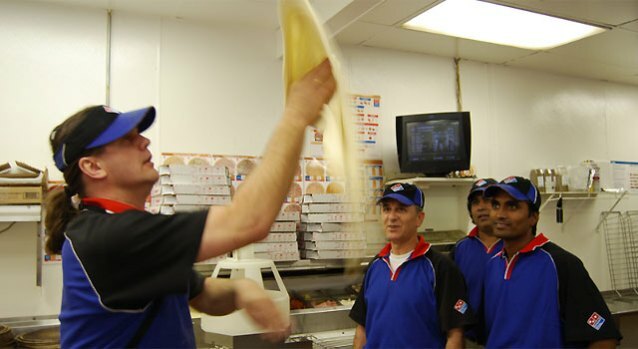 The pizza-making team of Robert Donner, Emmanuell Dicks and David Grisard have won the 2009 Domino’s Pizza Order Up! contest, held annually in Las Vegas. The three speedy pie makers are members of Team Washington, a franchise that has won 15 of the last 22 Domino's World's Fastest Pizza Maker titles, and are the first to win the title in its new group competition, according to Ester Tadena, a Domino's Team Washington spokesperson. "Team Route 1," as the three men call themselves, made seven pizzas in an impressive 1 minute and 11.89 seconds, earning them $18,000 in prize money. Runners up included a West Coast team, who took second place with a time of 1:16.7 and a Bethesda, Md. team led by Jim Moran, Jr. (yes, the Congressman's son) who took third place with a time of 1:22.28. The Bethesda team members are also employees of Team Washington. "This being a new contest, we knew we had to take it home," said Donner, a Regional Supervisor for Team Washington. "The tradition has always been there. And the passion that [Domino’s] has to be number 1 just pushed us to get it." The finalists represented Domino's Pizza stores from around the world, as far away as Malaysia. They had to hand-stretch fresh dough, pizza sauce and top four medium and three large pizzas with a variety of toppings as quickly as possible. While speed was important, it was only part of the recipe. Quality was moderated by judges highly qualified in Domino's standard pizza-making practices. If the pizza was not perfect, it was returned to the competitor who remade the entire pizza, while still being timed. Domino's began the "World's Fastest Pizza Maker" competition in 1982 to honor pizza makers who best exemplify the company's philosophy of keeping efficiency in the store to allow sufficient time for safe, timely pizza delivery. "The competition emphasizes Domino’s commitment to safely delivering piping hot, great-tasting pizzas to our customers' doors as quickly as possible," Tadena said. The "Order Up" competition was held May 11 at the Mandalay Bay Hotel and Casino in Las Vegas. The Story of Team Washington They met three decades ago as fraternity brothers in Mississippi, two compadres who would grow up to run one of the biggest, most profitable Domino's Pizza franchises in history. Right here in Alexandria, on Duke Street on the West End. Frank Meeks and David Carraway were more than best friends. In the deep South of the late '70s, they shared classes at the University of Southern Mississippi, and at night, with the cicadas chirping outside their window, they drank beer out of long-neck bottles andswapped dreams of brotherly entrepreneurship. To make an extra buck for beer and books, both delivered pizzas for a fledgling company called Domino's, which at the time only serviced a handful of college campuses nationwide....Read the rest at LocalKicks.com.